My chosen featured this week is: 5 Sure Ways to Perk Up by The Peculiar Treasure. Everybody has lulls in life, when we go through a period of time feeling down & out, depressed or cranky. Perhaps we don’t even know why. If you are feeling like that right now (an many do around this time of year), stop by her blog and give this post a read. Kristin has some great ideas for turning our spirits around! Hope N. Griffin from Finding Joy in Everyday Be sure to follow me on Facebook , Twitter and Instagram. Look around my blog for book reviews, military life, and more. 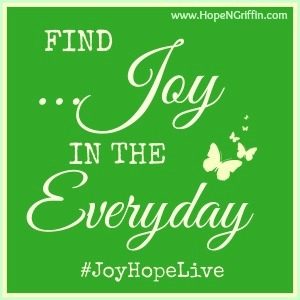 I will be retweeting your links tagged with #JoyHopeLive over the next week. Mary from My Life in Progress. Be sure to follow her on Facebook, Twitter and Pinterest. Visit her blog as she shares her experiences, thoughts, life & faith with you. She will be visiting your posts and commenting. 1. Add a link that captures how you Find Joy in the Everyday. It can be a craft, book review, personal story, etc. Just make sure it captures joy. Do not link up other link parties or product reviews. 2. Tweet or share on Facebook your link with #JoyHopeLive (this makes it simpler for me to give you a retweet and comment). Each week we add the posts to a pinterest board. Go love and share some pins. 3. Comment on the posts you love and the two directly before yours. Be sure to include #JoyHopeLive when you do so they know where you found them. 4. Grab the button! Share it on your sidebar or in your post so others will join us next week. By submitting a link to this party, you are giving the co-hosts permission to feature your post on their blogs and/or social media platforms and utilize your post images in order to facilitate this feature. To learn how to make the most of this, and other linkups, read a few tips here. Now you can also post your link on the pinned post on Hope’s facebook page for ease in sharing one another’s posts and getting more interaction. For better interaction share the link to your original Facebook share (I’ve left one of mine as an example). When you share a link on twitter be sure to add #JoyHopeLive for a RT. Thank you so much for the party, Joy! I hope you’re having a great week! Thank you, same to you, Pili! You are very welcome Kristin!